Image caption For many Taiwanese the star design surrounding the singer is a symbol of historical oppression. The singer has managed to alienate fans in both of the two rival nations by her use of symbols and flags on the latest stage of her 'Rebel Heart' tour. 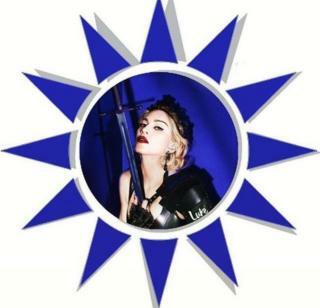 On Thursday as the singer prepared to play her first ever shows in Taiwan, she posted a picture of herself at the centre of a blue star design - which somebody in her organisation presumably believed to be a national emblem. The image appeared on both Madonna's Instagram and Facebook accounts with the greeting "Take a bow Tai-Pei". Unfortunately that design is actually an old badge of the Taiwanese political party the Kuomintang (KMT). For many Taiwanese it is strongly associated with the 'White Terror'', one of the bloodiest times in the country's history. It refers to a period in the 1950s and 60s when an estimated 18,000-30,000 of the island's elite were executed by the KMT as they tried to exert their control over Taiwan after the party's forces fled there to escape the Communist takeover of mainland China. It wasn't until 2008 that President Ma Ying-jeou made an official apology for the deaths. So when Taiwanese social media users spotted Madonna had appropriated the old KMT symbol - so synonymous with historical oppression - they made clear their displeasure in the comments on the picture. To make things even worse the current incarnation of the KMT has also fallen out of favour with many Taiwanese. In elections last month the party was thrown out of power by the Democratic Progressive Party. However, despite all this Madonna's KMT-referencing image remains - at time of writing - on both her Facebook and Instagram pages alongside scores of furious comments, some of which have been liked thousands of times. The singer has yet to comment publicly on the row, but has continued to post pictures from the first of her Taiwan concerts thanking the audience for their "electric and amazing" energy. Part of that more positive reaction was inspired by an onstage gesture which may have partially made amends to offended Taiwanese nationalists. As she has done elsewhere on the tour, Madonna performed her iconic hit "Holiday" wrapped in the flag of the country she was performing in. Clad in the actual Taiwanese flag she shouted at the crowd "I love China" and "I love Taiwan". Although this delighted many Taiwanese people it has had the opposite effect in China. China still views Taiwan as a break-away province rather than a separate country. And the Taiwanese flag is seen as a direct mark of defiance to any thought of reunification with the mainland. Chinese fans were unforgiving on social media with one post on micro blogging platform Weibo saying, "Is Taiwan a country? I am laughing to death…you are just a region." Others joined in by writing, "Disgraceful act, what kind of message are you sending to China?" and "What a cheap way to get attention from the mainland. Your music isn't very welcome or known in our country anyway." Most memorable of all perhaps was the Weibo user whose message to Madonna was: "Did you run out of your cone-shaped bras and had nothing better to wear?! Stupid western woman with no modesty." It isn't the first time a pop star has created controversy by their association with Taiwanese symbols. Last year Katy Perry wore a golden dressed studded with sunflowers, draped herself in a Taiwanese flag and induced outrage. More recently, 16-year-old K Pop singer Chou Tzu-yu from the nine piece band Twice was seen holding the Taiwanese flag on Korean television. Chinese internet users demanded that Twice be banned from performing in China. Chou Tzu-yu rapidly issued a video apology to China where she read from a script and said, "I'm sorry I should have come out earlier to apologise. I didn't come out until now because I didn't know how to face the situation and the public." She continued, "there is only one China. I am proud I am Chinese. As a Chinese person, while participating in activities abroad my improper behaviour hurt my company and netizens on both sides of the Strait. I feel deeply sorry and guilty. I decided to reflect on myself seriously and suspend all my activities in China." Some fans of Twice came out in support for Chou Tzu-yu and believed the apology to be unnecessary. Others felt that Tzu-yu was wrong to give in to Chinese pressure and should have stood her ground. Madonna at least does not need to worry that her career is likely to be damaged by a little controversy. In 2012, Sarah Reed was the victim of an assault by a police officer. Her death in a prison cell last month has prompted a surge of online grief and anger, driven by black British Twitter users.READ MORE.